Sets of Emperor or Empress with the retainer dolls were particularly popular in the Meiji to Taisho periods (late 1800s to early 1900s). The dolls we are offering here are probably Emperor Ojin and his retainer. Emperor Ojin (270-310) was the 15th Japanese emperor and was known as a fearless warrior and son of Emperor Chuai and Empress Jingu. Sometime in 300 AD, when Emperor Chuai was ready to conquer the land of Kumaso (the southern Kyushu island, Japan), a god appeared in his wife's (Empress Jingu) dream. He pointed at the sea, in the direction of Korea instead. Emperor Chuai ignored the warning and consequently died while invading Kumaso. His widow, fearing another misfortune upon her family, gathered up the troops and embarked on a conquest to Korea (around AD 350). Her invasion ended in victory and she gave birth to a boy (later Emperor Ojin) after returning to her homeland. There are a set of dolls for this; Empress Jingo is often dressed as a warrior and at her side was the faithful old minister (Takenouchi-No-Suke) holding baby Ojin (later Emperor Ojin). 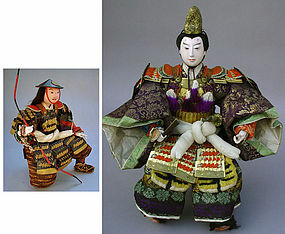 The brocades on the emperor’s attire are beautiful, finely woven in doll size. These particular designs (later called yusoku design) originally arrived from China and with some modification became popular among the aristocrats during the Heian period (794-1185). The name ‘yusoku’ derived from ‘yusoku’, the job title of some important officials in the imperial court, had these designs on their clothing during early times. The doll’s hair is made with black silk threads covering horse hair (retainer) and human hair? (Emperor). The Emperor’s shoes are covered with hair resembling bear fur; his sword is covered with a fur-like material and short wakizashi with snake skin like material with an imperial chrysanthemum. More chrysanthemums on the breast plate of his armor. All the retainer dolls are usually not handsome to enhance the greatness and blue blood of the emperor; some look quite funny or small contrary to the handsome general/emperor dolls. The retainer’s sandals appear to be woven from straw as a real pair.